Being a ‘lone worker’ is great! You’re not stuck in an office all day having to listen to Wendy’s ‘jokes’ or more stories about her cat. You’re out and about all day or just quietly working somewhere enjoying your own company. But what about your safety? No one likes to think about all the things that could potentially go wrong each day, but if you are a lone worker, safety needs to be your main concern. 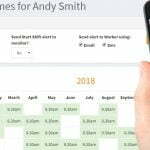 There are many different solutions available to lone workers to allow them to keep in touch, however not all of them are as convenient as a Smartphone app. Some companies have bespoke, custom-made devices that workers must carry with them throughout the day, but these are often cumbersome, very expensive to buy and you are often tied into long contracts. Using a lone worker app on your Smartphone gives you the best of both worlds!